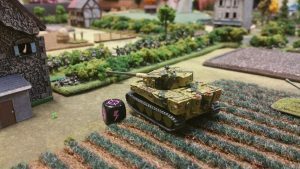 Hosted by Conquest 2019 Saturday April 20, 2019 Organised By Django Upton Conquest 2019 is a general games convention held in Melbourne over the Easter weekend (April 19-22, 2019). This Flames of War tournament is one of many events at the convention. 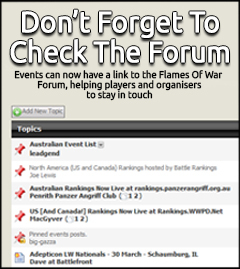 The rules used will be Flames of War 3rd Edition including … Continue reading "Victorian Flames of War Championship 2019"
April 20th Mid War (Your Hobby Place, Fredericksburg, VA) Where: Your Hobby Place 4264 Plank Road Fredericksburg, Virginia 540-785-4263 When: Saturday, April 20th at 10 AM Theme: V4 Mid War. 109 Points Cost: 10 Dollars, which goes towards Pizza for Lunch and Prize Support. Contact: To signup, contact Ed Sales at [email protected] Schedule Registration = … Continue reading "MW 109 Points at Your Hobby Place (Virginia)"